Sometimes, transitioning a cat from outdoors to indoors as easy as closing the door. Sometimes, you and they need a little more help! Cats are remarkable creatures, amazingly adaptable, independent and resilient yet dependent and sensitive too. They’re also each incredibly unique personalities made up of their biological and environmental backgrounds. When you adopt a cat from a shelter or rescue one from the street where you don’t know much if anything about what their life was before they joined yours, it’s an interesting discovery process. This is never more true than when you you want to keep your cat safe and healthy by transitioning him from spending time outdoors to living as an indoor-only pet. We’re here to help you if you’re wondering about or struggling with that process! Let’s say you have a cat you took in, say from a neighbor too elderly to care for the cat any longer. The neighbor used to let him go in and out, but your worried about the neighborhood coytoes/hawks/mean cats/cars/etc so you want to keep him inside. But he meows and scratches nonstop at the door or window to be let outside, even dashes out the front door the second you open it. How can you get him to be happy just staying inside? 1. Make sure he’s spayed or neutered and healthy. If you’re getting him fixed, take advantage of the fact that they often don’t feel so great right afterwards to show him how nice and cozy it is on his special bed inside the closet or on top of the cat tree. 2. Move and take the cat with you. Only half-joking about this! This is why when you adopt a cat from the shelter, it’s usually super easy to make them an indoor-only pet. Especially if you use tip #3 below. Start them in your new home in a starter room with a litter box, bed, scratching post, and after a few days you can let give them access to the rest of your home. 3. 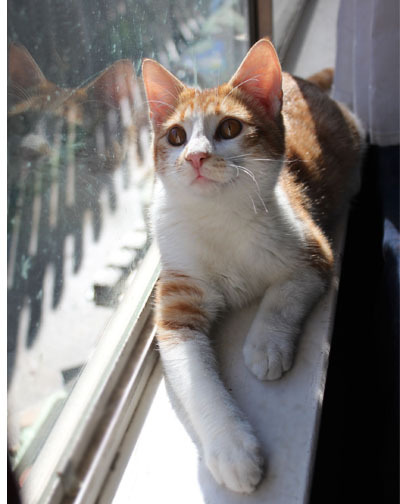 Go overboard with using all of our 5 tips for keeping an indoor cat happy. That means tons of playing and exercise, leaving securely screened windows open, and trying all sorts of cat condos, shelving, cardboard boxes, hiding places… get creative! 4. Build a catio for him. 5. Keep him from doordashing. 6. Hang a bird feeder near a window to make for easy bird watching. 7. Use calming feliway pheromone plugins in every room. What about reduce his time outside gradually? In my experience and what I’ve heard from others who’ve tried this, it seems to just keeps reminding them how much fun it is outside, and what you want to do is make him realize how much fun it is to be inside. It does work for some cats. We hope these tips help you transition your outdoor cat to be a happy healthy and safe indoor kitty!